An effective meeting starts with a meeting agenda. An agenda serves as the outline of important meeting information, and what will be covered. It provides clear direction for meetings and can save you several hours per month. If you want to learn what makes a meeting agenda effective, this resource is for you. We’ll break down the most important elements of an agenda, go over the steps you should follow when creating one, and end with some samples and a free agenda template. Climate for Change are looking for a new group of up to 25 committed volunteers to join in 2019. You will learn and work with a small, hard-working team to design and implement an ambitious real-life fundraising project in a fun and supportive environment. This is a great opportunity for someone wanting first-hand experience in the not-for-profit sector, while gaining fundamental skills needed for fundraising, communications and community organising. The first part of the fellowship will involve weekly sessions covering everything from fundraising strategy to values-based communication delivered by industry experts, while the second part will focus on project work. To ensure you have the skills and knowledge needed to successfully complete these projects, you will be trained and supported by experts in a range of fundraising and communication fields. Creative, empowering and diverse processes can be used to work with a group to establish their personal and group needs, values, principles and ethics then come to shared understandings and agreements. The analogy of the seed is part of a meta process Robin is developing called ‘The Vision Tree Process’. The next stage is to explore the Group Vision and the things that help the seed to grow. The whole process will be detailed in Dynamic Teaching and Facilitation – The Foundations which is mini book one of the series Robin is writing and due out by the middle of the year. As a leader, you need to both identify and make the most of the wisdom and experience in your organisation or team. With so many operational issues to address and negotiate, however, the emotional content is often overlooked. The advantage of an emotionally resilient leader is having the skills and awareness to build a stronger, more successful organisation. We provide a comprehensive container to develop the practical skills and confidence you require for collaborative management. You will learn more about yourself as a manager. This provides a strong and practical foundation for enhancing your management skills. Extended leadership skills: building emotional resilience to handle ‘tricky’ encounters; the micro skills for good management; being conscious of your personal motivations; your leadership style and its impact; how you can change your practices to better match your values; your capacity to effect change and influence values; and taking care of yourself. How we affect each other: Understanding the unconscious dynamics at work in a team; Organisational dynamics and our role; The unspoken components of organisational culture; and Role theory – roles people play in teams and how we can avoid getting stuck. Working well with groups to harness the wisdom of everyone present, for the best outcome, requires more than experience in the role of running a meeting or leading a team. Development of effective communication and leadership skills, self-awareness and actively applying compassion are all required for to be a good facilitator. People with obvious and not-so-obvious disabilities need accommodation in order to participate fully. As a presenter, you may or may not be aware of a participant’s need for accommodations. In addition to accommodating the accessibility needs of participants who request them, you are urged to follow these 15 basic accessibility guidelines for every workshop activity. Ed (GroupWork Institute of Australia) reflects: There’s a lot to be gained in digging a bit deeper into why you may be finding your meetings frustrating. People instantly get it when we encourage structure around meetings by emphasising the importance of Beginning, Middle, End and allowing enough time. But we’re often met with some surprise at our emphasis on the ‘soft skills’ approach needed for Facilitating Great Meetings. It seems they’ve been concentrating on the task and not how the participants work together. Ed’s blog tackles three traps: discussion with decision; people shying away from a difference of opinion; and unconscious hijacking of the airspace. Developed by Yes! 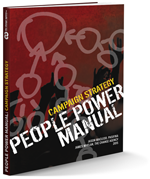 this manual contains dozens of energising, participatory exercises to use with groups of any age.